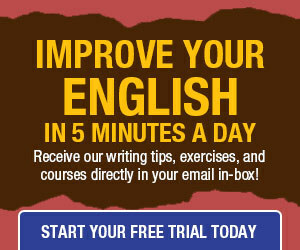 Here are several questions from DailyWritingTips.com readers about use of prepositions, and my responses. 1. This sentence showcases my burning semicolon question: “That’s a great trick; best I’ve seen in ages.” I know the second clause in it contains no subject (or noun), at least explicitly. I’m therefore wondering whether this sentence can take a semicolon — perhaps because the subject in the second clause is implied — or instead deserves an em dash because there’s no second subject at all. The sentence, as you wrote it, is correct — as you mention, the subject is implicit — but the formality of the semicolon is at odds with the informality of the omission of the subject, so I’d opt for a breezy em dash instead. 3. So, a comma in place of a semicolon is wrong? I once read a book on crafting sentences that mentioned that a semicolon is never accepted in American fiction and that a comma can always do the work. I’ve been going by this standard, and I like the economy and simplicity of the comma compared to the clumsy, Britishy semicolon. Do you think I’m wrong? A semicolon does seem intrusively formal for transcribing speech — whether within dialogue in fiction or when quoting a speaker — but replacing it with a comma is erroneous, and the book’s advice is unfortunate. I recommend using an em dash or starting a new sentence instead. The first example is incorrect. A semicolon has two functions. 1) to separate two independent, linked clauses. The second part of the example is not an independent clause. A colon or em dash could be used. The attendees at the meeting were: John Smith, treasurer; Jill Brown, vice president. For once I have to disagree with you. In your second point above, I agree that the original example given by your questioner does not need a semi-colon to delineate the items in a simple list. But your own extension of this turns the simple list into a complex list by introducing internal punctuation (a comma) within each item. The items with sub-clauses therefore need to be separated by a semi-colon, partly because it’s correct grammar, but also because it becomes confusing to read with the plethora of commas and unclear where each item ends. In your comments for question number three, you state that replacing a semicolon with a period is erroneous. The question is about replacing a semicolon with a comma, not a period. Was the question transcribed incorrectly, or (what I believe) is the response meant to be a comma instead of a period? If it is not a mistake, does the answer still remain true? Here be me yet again! Who would think that a grammar light-weight would weigh in for a second bout. Where an em dash creates a long separation between two thoughts, a semi-colon ABUTS them up against each other. CONTRASTING opposing thoughts in either fiction or non-fiction is tricky, but powerful when used correctly. These are never hyphenated flyweight, bantamweight, lightweight, middleweight, heavyweight, superheavyweight. These are all terms from the sports of boxing, wrestling, and weighlifting, so if you are not familiar with those sports, the words could be mysterious to you. The best rule is to avoid unnecessary hyphens and dashes. Also, the words midway and halfway are not hyphenated. The words “semicolon” and “nonfiction” are not hyphenated. These prefixes only require hyphens before proper nouns, such as in semi-Saharan and non-British. 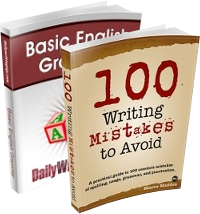 There has been a recent article in this series about the excess use of hyphens. The word “subclause” is not hyphenated, and the only common word with sub hyphenated onto it is “sub-Saharan”. Sorry about you Britons and your love for hyphens, but note that the word “demisemiquaver” is identified in dictionaries and encyclopedias as a British spelling! I’m a bit confused on the first question. Suppose the second clause (which, as you say, has an implied subject) was written “the best trick I have seen in ages”. Which is the subject: “the best trick” or “I”? I’d say the subject is “I” while “the best trick” is the object. If that is the case, why then are we saying the subject in this clause is implied? I always thought when using a semicolon that the last item listed was separated by a comma. Would you look at this sentence and tell me if I needed another semicolon after 2012 or is the comma okay? We present programs every weekend: 54 times in 2009; 87 in 2010; 109 in 2011; 85 in 2012, and 77 concerts in our “#7 Sabbatical” year in 2013. I like to use semicolons more than most people; however, I often go back over my work and will replace a few of them with a faster reading dash.